"Vienna or Death" is the third volume in our “Age of Muskets” series and it can be played together with Volume II "Eagles Rising". It depicts the campaigns that took place during 1796-1797 and again in 1799-1800 in southern Germany, the Rhine and Danube river areas and northern Switzerland. As in Volume II, it's a two-in-one game since the first group of scenarios show the brilliant campaign of 1796 of Archduke Charles of Austria, who defeated and expelled from Germany the French Armies that had launched an invasion across the Rhine; and it also includes other scenarios centered on the Swiss-German side of the Austro-Russian offensive of 1799. They depict the Allied advance into Switzerland and the Alps and their defeat that culminated in the outstanding victory of the French troops led by Moreau at Hohenlinden. As in Volume I the game includes all the elements that characterized pre-industrial warfare. However, the player will also find some elements distinctive of this campaign, as Alpine terrain, a different map and time scale to reflect the duration of the campaign as well as special rules to play the longest campaign scenarios together with those of Volume II "Eagles Rising". Given the size of the armies involved most of the scenarios of this Volume are quite adequate for two to four players since there are few headquarters and their size is quite manageable. 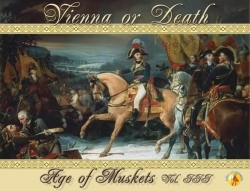 "Vienna or Death" is more than just a game. It comes with 6 introductory battle scenarios –Wurzburg, Neresheim, Schliengen, Ostrach, Stockach, Hohenlinden- to learn the battle rules and 11 campaign scenarios of increasing complexity. From the first ("Mountain warfare" lasting four turns) to the whole campaigns of 1796-97 and 1799-1800. Furthermore, there are scenarios to be played using volumes II and III together to play both campaigns on the three fronts, Germany, Switzerland and Italy!! !